NEW YORK (CNS) — With “Rogue One: A Star Wars Story,” last year’s promising reignition of the iconic franchise, “The Force Awakens,” gains a worthy — and equally family-friendly — companion. “A New Worry” might be an apt subtitle for “Rogue One” since its plot is driven by the fact that the evil Empire — served, most prominently, by Grand Moff Tarkin (a computer-generated projection of the late Peter Cushing) and Orson Krennic (Ben Mendelsohn) — is on the verge of deploying a game-changing new weapon, the Death Star. With its potential to wipe out entire planets, the Death Star could doom the efforts of the gallant Rebel Alliance, headed by Mon Mothma (Genevieve O’Reilly), to resist subjugation. 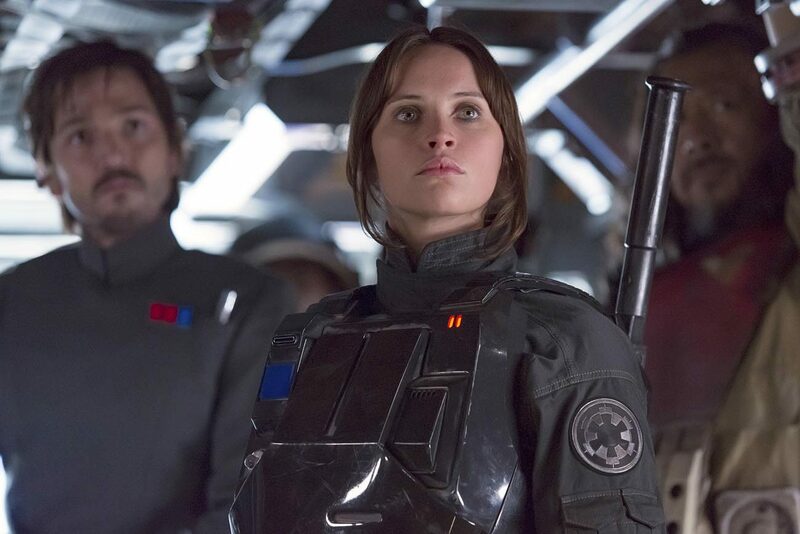 This crisis draws the movie’s main character, Jyn Erso (Felicity Jones), to center stage. As the daughter of Galen Erso (Mads Mikkelsen), the brilliant scientist who unwillingly developed the technology behind the Death Star while being held captive, she has reason to believe that the armament can be sabotaged from within. To prove this, she’ll need the help of intrepid Alliance officer Capt. Cassian Andor (Diego Luna) as well as that of his mechanical sidekick, K-2SO (Alan Tudyk). An amusingly straight-talking android, K-2SO is the source of most of the movie’s wry comic relief. In crafting an exciting epic, director Gareth Edwards keeps the mayhem inherent in his story of armed conflict virtually bloodless. And the script, by Chris Weitz and Tony Gilroy, celebrates altruism while also briefly tackling the morality of obeying some military orders. But the ambiguous nature of the spiritual “Force” cultivated primarily, in this installment, by blind Buddhist-style monk Chirrut Imwe (Donnie Yen) may be a source of concern for the parents of some teens. Since the Force can be interpreted in any number of ways, including a vaguely Christian one — the famous blessing it inspires having an almost liturgical ring to it — youngsters may need guidance to arrive at sound conclusions. For all others, “Rogue One” offers old-fashioned entertainment in the best sense: an engaging showdown between plucky goodness and elegant villainy with a bit of delightfully innocent romance thrown in for good measure. The film contains frequent but thoroughly stylized combat violence, religious elements requiring mature discernment and some frightening images including a scene leading up to mental torture. The Catholic News Service classification is A-II — adults and adolescents. The Motion Picture Association of America rating is PG-13 — parents strongly cautioned. Some material may be inappropriate for children under 13.